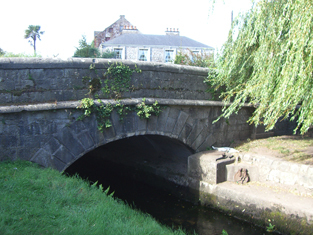 Heritage Week 2015 – Tour of Midleton’s commercial and industrial heritage. 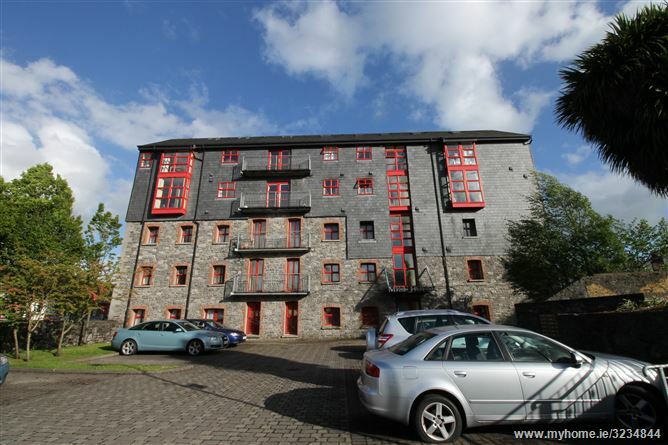 Now converted into apartments, Allin’s Mill, or Midleton Mill, may stand on the site of the old monastic mill. it was established to supply grain to Cork and England in the 1820s in the wake of the Corn Laws. About twenty people joined our tour of Midleton’s commercial and industrial heritage today at 2.30 pm. Starting at the Library (the Market House of 1789) we proceeded to Church Lane (site of the old butter market) then up Main Street to Old Bank House (former Munster Bank) and on to the Munster and Leinster Bank (now AIB). On the Clonmult Monument island we discussed the Fair Green, Allin’s mill, Hackett’s distillery and the railway from Cork to Youghal. Down the eastern side of Main Street we assembled in Connolly Street (former Charles St) to discuss the changing businesses in the town from 1824 to 1856 and then in 1881. This was followed by a stroll to the Pugin building (former Midleton Arms Hotel/McDaid’s pub), a look at Brodrick Street (site of Midleton Gasworks and JJ Coffey & Sons, builders), and into the former Coppinger’s brewery. Then at the entrance to Distillery Walk we examined Coppinger’s grain stores and the old distillery, previously Marcus Lynch’s wool factory of 1793). We finished up by discussing the first bank in Midleton (the National Bank of Ireland at the Rock, run by the Coppingers). Despite the best efforts of Met Eireann to scare everyone off with horrible weather warnings, it turned out to be a lovely day for a walk – the best of the sunshine coming as we walked back down the Main Street. I’d like to thank everyone who turned up today. You helped to kick off Heritage Week 2015 in Midleton in fine style! The vintage cars motoring to Carrigtwohill were an unexpected bonus! ‘…a good market for flesh…and fish…’ – the Commercial and Industrial history of Midleton and Ballinacurra, 1608-1948. Public local history lecture, Wednesday, 26 August at 2.00pm in Midleton Library. 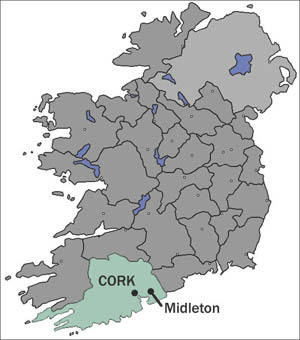 From Mainistir na Corann to Midleton, 1177-1670. 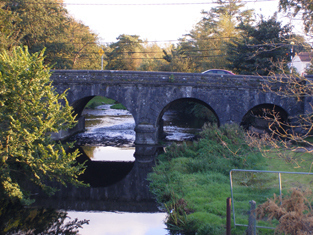 Public local history lecture, Thursday, 27 August at 8.00pm in MyPlace, Midleton. 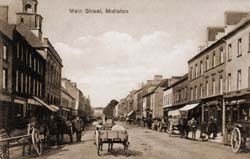 Discover the Commerical and Industrial Heritage of Midleton. Walking tour, Sunday, 30 August at 2.30pm. Meeting at the Library. Markets and Fairs in early Stuart Imokilly and Barrymore. 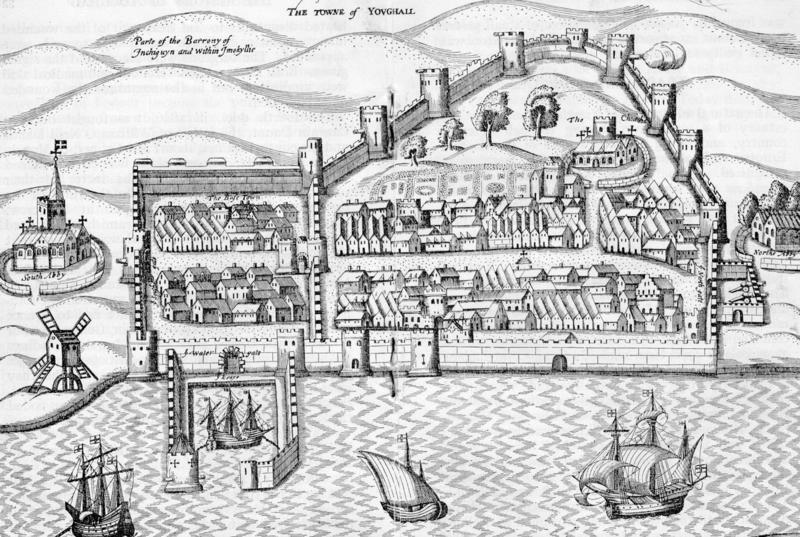 With Cork, Youghal was the most important town in the county in 1600. It was the center of commerce in the eastern part of County Cork. Its development was promoted by Richard Boyle, Earl of Cork for forty years until 1642. One of the aspects of regional history in Ireland was the existence of Presidencies in the provinces of Munster and Connacht. These were subordinate authorities set up in the sixteenth century to impose greater governmental control over these provinces.They alleviated the burden of control placed on the Castle (the government in Dublin Castle) and allowed for more rapid response to local issues. Shortly after the climactic Battle of Kinsale in 1601 and the ending of the Nine Year’s War in 1603, the Council of Munster (the Lord President of Munster and his chief officials) set to work on modernizing the regional economy. The key to this was the encouragement of a monetary economy based on licensed and regulated markets and fairs. Margaret Curtis Clayton has done a splendid job of compiling the information on the markets and fairs that were newly licensed in Munster in the period 1600-1630. It should be noted that the establishment of a market or fair on someone’s property generated additional lucrative income and often enhanced an existing settlement or improved its economic prospects. The period from 1603 to 1642 was one of rapid economic change in south east Cork. It’s worth noting that Chore Abbey (Midleton) had a market licence from 1608 renewed in 1624 – suggesting that the settlement that survived the dissolution of the Cistercian abbey was now thriving. The proximity of an annual fair in Castleredmond, first licensed in 1609, was a further boost to the local economy. In each case the licence was issued to the proprietor or landlord, who was then obliged to appoint a clerk of the market to regulate it. The proprietor also had to designate a place for the market or fair and ran a pie-powder court to settle disputes. (The name comes from the French term pied poudre, or dusty feet, for the court was a summary court conducted on the spot.) The proprietor had to pay an annual fee to the Crown for the licence and was entitled to keep the fees charged to stall-holders and the profits of justice from the pie powder court. It is worth noting that fairs were often linked to church feastdays. 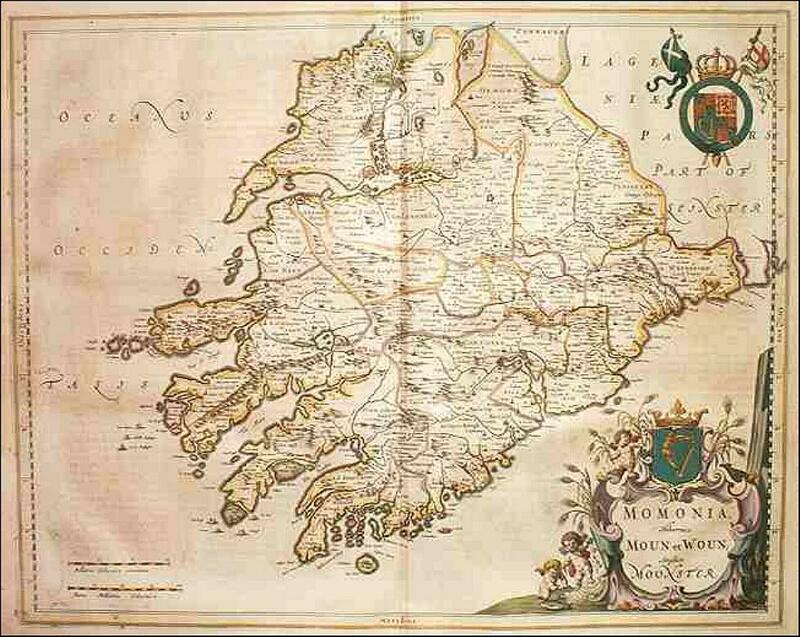 John Speed’s map of the province of Munster 1600-1611. In this post our concern is the licensing of such markets and fairs in the south east Cork baronies of Imokilly and Barrymore. Carrigtwohill: 5 Feb 1607/8. Fair – no details. Prop. David Barry, Viscount Buttevant. Renewed 1618, details lost. Chore Abbey (Midleton): 14 Oct 1608. Market on Saturday. Prop. Sir John FitzEdmund FitzGerald. Rent: 5s English. Renewed in favour of Richard Boyle, Earl of Cork, on 23 Dec 1624, for a rent of 6s.8d. Dangandonyvane: 25 Nov. 1606. Fair on Feast of St James (25th July) & 2 days following. Prop. Thomas FitzGerald. Rent not recorded. Killeagh:11 July 1631. Market on Tuesday. Fairs on 1 June and 1 November each with one day following. Prop. William Supple. Rent not recorded. Rostellan: 25 Nov. 1606. Market on Saturday. Prop. Thomas FitzGerald. Rent not recorded. Youghal: 22 Dec 1609. Market on Wednesday and Saturday. Fairs on Eve of St Luke (18 October) & 3 days following and on the Feast of the Ascension (usually late May). Prop Youghal Corporation. Free of rent. What is of interest are the two market days in Youghal and the two annual fairs there. Clearly Youghal was of major importance. Cork appears to have had a market every day until 1613 when a shortage of goods led to the market being restricted to Wednesday and Saturday. Also of note is the absence of any licence for a market in Cloyne, Ballinacorra, Mogeely or Ballymartyr (Castlemartyr). Nor is there any market on Great Island – the nearest one being in Carrigtwohill. The absence of a market in Cloyne suggests that Sir John FitzEdmund FitzGerald was wary of intruding on pre-existing market rights established by the bishops during the medieval period. The market in Carrigtwohill followed a tradition of markets going back to the 1200s. In respect of Chore Abbey (Midleton), it is interesting to note that Richard Boyle, Earl of Cork, succeeded Sir John FitzEdmund FitzGerald as leaseholder of both the old monastic estate, and Castleredmond. FitzGerald had died in 1612. Reference: Margaret Curtis Clayton: ‘Early Stuart markets and fairs in Munster, c1600-1630.’ Journal of the Cork Historical and Archaeological Society, vol 115 (2010), pp 167-177. Ballinacorra’s medieval import? Dundry stone for Cloyne Cathedral. The blocked up great window of the south transept of Cloyne Cathedral. The carved stone that marks the outline of the window is not native to Cloyne or even to Ireland. 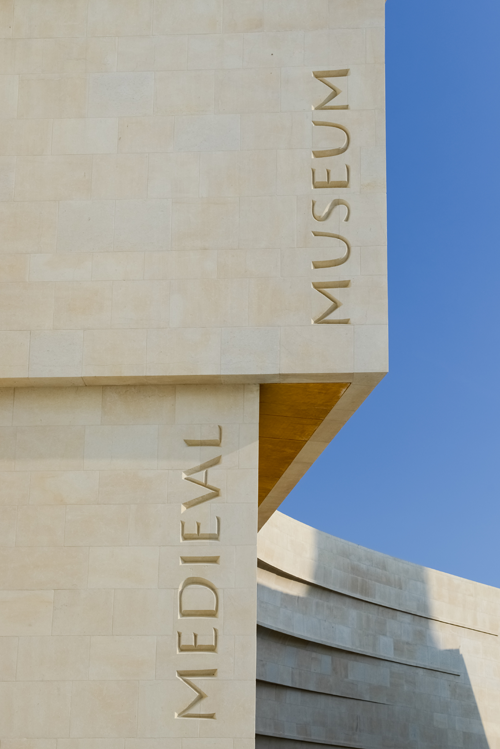 It was imported from Dundry near Bristol in the thirteenth century. Sadly the great window was crudely blocked up in the middle of the eighteenth century to accommodate the memorials of the Longfield family of nearby Castle Mary. The old phrase ‘coals to Newcastle’ refers to the shipping of coal from Newcastle to London from the seventeenth century. The idea that anyone would ship coal TO Newcastle in the far north of England was so odd that the phrase was used to describe very peculiar behaviour. Yet Ireland, a land rich in stone, imported tons of stone from England during the medieval period! Sometimes, if you know where to look, you can just pick up evidence of the trading links that existed in a place centuries ago. However, some of this evidence may reveal something of the local Irish trading patterns and infrastructure in medieval times. The Waterford Museum of Treasures is the best municipal museum system in Ireland. The medieval museum is a modern building built on the vaulted undercroft of the Choristers’ Hall beside Christchurch Cathedral in Waterford. Dundry stone was used to clad this building in recognition of the original use of the stone for the medieval cathedral. This picture gives a good idea of the pale honey colour of the stone. Recently I read a fascinating book edited by Professor Roger Stalley of Trinity College Dublin. The book, Irish Gothic Architecture: construction, decay and reinvention, is a collection of excellent research essays on the topic of later medieval Irish architecture, particularly Gothic architecture, although it also looks at nineteenth century perceptions of Gothic architecture. The essays are wonderful, but one made me sit up and go back over it carefully. The reason was the sentence quoted at the top of this post. 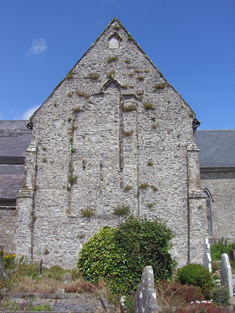 The essay discussed the building of several cathedrals in Ireland in the thirteenth century, but the discussion of Cloyne Cathedral is important for those interested in south-east Cork. While most of the stonework in the windows of the cathedral has been redone at a later stage, especially in the nineteenth century, those windows in the south transept are original to the building. They were created when the transept was first built in the 1200s. How did Professor Stalley know this? Well he certainly didn’t consult any surviving documents. Instead he looked at the woindows, especially on the outside, and realized that the stone used to build these windows wasn’t local. But he recognized the stone, nonetheless. It is an oolitic limestone that came from Dundry, a quarry located in the extreme north of Somerset and only a few miles south of Bristol, in the west of England! The medieval vaulted undercroft of the Choristers’ Hall in Waterford was built of Dundry Stone. The arcade was inserted later, in the sixteenth or seventeenth century. Dundry stone was imported into Ireland following the Anglo-Norman invasion of 1169/70. This stone was famously used to build Christchurch Cathedral in Dublin, but in fact, was used in churches from Kinsale in County Cork to Trim in County Meath. It was used for parish churches, monastic churches and cathedrals, but now Cloyne Cathedral joins the list. But why import stone into a country that is already rich in building stone? The most likely reason is that some of the principal masons working on these churches were also English. These English masons came to Ireland because they were familiar with erecting and decorating large stone churches, which were still a fairly new phenomenon in Ireland, having been introduced here just thirty years earlier..
Now these English masons almost certainly came from the West Country of England, for the architecture of Christchurch, Dublin, and other buildings, suggest similarities to some of the architectural features used in the west of England.churches. These masons were entirely familiar with the stone that was available in the west of England.. But in Ireland they discovered that the local stone was different – mostly a hard limestone that the masons found difficult to carve. So they did what the first Norman masons did in England just after the Conquest in 1066 – they imported the stone that they were familiar with. So, just as the earliest Norman masons imported Caen stone for the Tower of London, so the earliest English masons in Ireland imported Dundry stone to make the carved window openings and other decorations. 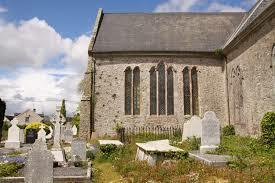 However, by the time the cathedral was built in Cloyne, it is possible that most of the work was done by Irish masons. Sadly, the cathedral accounts do not survive so we really don’t know who built the structure. Whoever they were, they knew about Dundry stone and they chose it for the window openings. 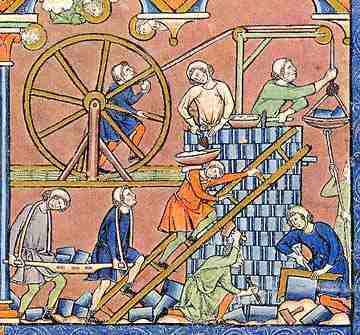 Building the Tower of Babel was a favoured imaged of medieval book illuminators because it depicted the vanity of man. These images are valuable for modern scholars seeking to understand the workings of medieval masons. But what Stalley does not consider is the implications of importing this stone from England into south-east Cork . This is where economics come into play. Most of the Dundry stone used in Ireland went to places that were accessible by water, being located either on the coast or by a river.The reason this mattered was simple – it just cost too much to freight the stone by cart over land. The more of the stone that could be shipped by water as close as possible to the building site, the cheaper the cost of importing it. The three eastern windows of the south transept of Cloyne Cathedral are also framed in Dundry stone. So we need to identify a port that could have been used to import the Dundry stone. Given the economics of moving building stone over land, I would suggest three possible candidates – Ballycotton (directly facing the Bristol Channel, Aghada, the first seat of Robert FitzStephen in Cork and just inside the entrance to Cork Harbour, and Ballinacorra. The first, Ballycotton, presents problems, because it does not seem to have been a major port with the appropriate facilities for offloading heavy cargo. By the time the cathedral was built in Cloyne, Ballycotton seems to have become a fishing village only. Aghada was only used as a caput baroniae (baronial seat) for a short period in the late twelfth century, by 1200 it had been replaced by Ballinacorra. Ballinacorra is much further from the open sea than Aghada, being part of the inner harbour area and possessed ancient links to Cloyne – its ‘great church’ was dedicated to St Colman, suggesting that it was founded directly from Cloyne, probably as a port within Cork Harbour. The present Ballinacorra village is located just a few miles from Cloyne and the terrain is not difficult, so getting shipments of Dundry stone to the cathedral site would have been relatively easy. Remember, only the cut stone was being shipped in – this was a very small amount of the overall amount of stone used in the cathedral. My own opinion, alas not supported by any documentary evidence, is that the Dundry stone for Cloyne came through the port of Ballinacorra. Sadly, in the middle of the eighteenth century the Longfield family of nearby Castle Mary had the great thirteenth century five light window in the south transept of Cloyne Cathedral crudely blocked up to provide space for their family memorials. Reference:Roger Stalley, editior, Irish Gothic Architecture: construction, decay and reinvention. Wordwell Press, Dublin 2012. The quotation at the head of this post is is from the essay by Roger Stalley: ‘Cathedral-building in thirteenth century Ireland,’ contained within the volume. .